I have ignored Paula’s Choice’s Clinical Ultra-Rich Moisturizer for a long time, because “very dry” never appealed to me. To be honest I also had a problem with its name “Ultra-Rich”. I always imagined the texture to be displeasingly fatty or greasy and assumed this product would be too rich for my normal or sometimes slightly dry skin. But after trying it out for the first time I actually fell in love with it! What does Paula’s Choice promise? This all sounds very pleasant, but is this moisturizer really as good as the manufacturer promises? I will tell you about it in this article. 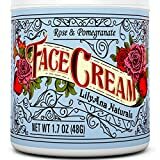 1 Face Cream Moisturizer (1.7 OZ) Natural Anti Aging Skin Care 1134 Reviews $18.99 SHOP NOW! 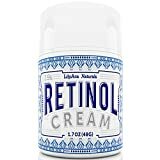 2 Retinol Cream Moisturizer for Face and Eyes, Use Day and Night - for Anti Aging, Acne, Wrinkles -... 1059 Reviews $18.99 SHOP NOW! 3 Baebody Retinol Moisturizer Cream for Face and Eye Area. - With 2.5% Active Retinol, Hyaluronic... 1671 Reviews $19.95 SHOP NOW! This cream is easy to spread and gives dry skin a smooth and velvety softness. I am really thrilled about the moisturizer’s texture. The cream is white and thick but at the same time still feels really soft and tender. The main ingredient is shea butter, so I guess that explains this softness. It is also quite odorless. There are no added fragrances or perfumes. You can only slightly smell the fragrance of the different ingredients. Even though this cream is extremely rich it does not feel greasy on my skin. Despite its thick consistence it is easy to spread and merges gently with my skin. It sets in fast and makes the skin feel soft and silky without leaving any greasy film. I need to point out that I use the moisturizer sparingly and always take about the size of a lentil (0.5 – 1 ml), which is absolutely enough for me. I assume skin that tends to persistent dryness will only get a fatty or greasy feeling to it when too much of this product is applied to the skin. The best is always to try out how much cream is the right amount for your skin. There is actually one thing I would like for this product to improve. Because the opening of this tube is too big, it is not possible for me to precisely extract the wanted amount of this cream. A pump dispenser would have been more accurate and useful. Oh, and I also want to mention that the Clinical Moisturizer can also be used like an intensive eye cream! The under-eye area is often a lot dryer than other facial areas. It also tends to get more wrinkles because of the thin skin. But as always, Paula’s Choice has not added any well-known irritating agents that could get into the eyes and burn or itch. The pleasant and smooth texture is combined with an excellent immediate and long-term effect. Directly after applying the cream I can see a firmer and silkier complexion. Also the skin feels relaxed, smooth and tender. My skin’s surface seems a bit smoother and the moisturizer immediately relieves dry, rough and flaky skin areas. I sometimes have a slightly flaky nose and for that it worked really well. I normally don’t have dry skin, neurodermatitis or eczemas, so I cannot tell you if it really works for those skin problems. But Paula’s Choice recommends the Clinical Ultra-Rich Moisturizer for exactly those things. This moisturizer can show its full potential best if it is used consequently every day. Paula’s Choice emphasizes that their product is a cocktail of oil replenishing active and anti-irritant agents as well as antioxidants. The cream provides the skin with important lipids and decreases the loss of moisture. Your skin will feel tranquilized, less tight and the first signs of aging will be reduced. This product’s natural formula is dominated by emollients like shea butter, olive oil, dimethicone and many others. Also they set the value on a reasonable composition of fatty acids, ceramides and cholesterol. These physiological lipids are essential for a healthy and balanced skin protection barrier. I think it is important to mention that I always combine the Clinical Moisturizer with products that have a high amount of active agents (e.g. Glycerin, Hyaluronic Acid, Panthenol). My skin tends to dry out because it is missing moisture. The Clinical Ultra-Rich Moisturizer is able to lower the skin’s loss of moisture, but does not replenish the moisture. If your skin is not only low on fat or oil, but is at the same time needs to be hydrated you should consider using serums like Hyaluronic Acid Serum or Vitamin C Serum. These products moisten your skin and seal the moisture, so it stays there. The Clinical Ultra-Rich Moisturizer gives a valuable completion for my skin care routine. I often use it as night cream but also during the day underneath sun protection and makeup. I am really satisfied with this moisturizer. It really tends my skin well and because of its occlusive performance it is ideal in the cold months of autumn and winter. So, the winter can come! This product is a bit more expensive but the value I get for the money is acceptable for me and sometimes special offers can make it a bit cheaper. Paula’s Choice Clinical Ultra-Rich Moisturizer stands out compared to other similar products because of its formula with extra antioxidants and anti-irritant agents. The shea butter and coconut oil give it a rich and velvety cream-texture. These ingredients also make the skin smooth and relieve extremely dry and tight skin. Do you have some experience with Paula’s Choice Ultra Rich Moisturizer?